In March 2014, food historian and Labour Party Parliamentary Candidate for Loughborough Matthew O’Callaghan gave a non-political historical lecture at Loughborough University. He explained that food has been political from the very beginning of civilisation, with the geographical and social landscape of the world both being influenced by food. The Politics of Food began with the hunter gathering food, which gave rise to the need for ‘the family’ – a community of individuals for which sufficient food had to be found for survival. The next step was the organisation of society for the process of farming and the production of wheat and the introduction of irrigation to increase crop yield, all of which required a communal effort and cooperation. Agriculture gave rise to landholding – the ownership of land and everything on it – to prevent people helping themselves to crops and benefiting from the hard work of others. When more food could be grown that was needed to survive, a ruling class arose, which had time and money for leisure pursuits. Matthew pointed out that migrants to Britain have always brought new foodstuffs with them and these in turn have influenced the diet of the entire population. The Roman invasions expanded the British culinary repertoire with food such as rabbit, apples and wine and put the good food onto the British cultural calendar. The Germanic Angle and Saxon migrants and, later Normans added their own favoured foodstuffs to the British cuisine. In medieval times, crusading knights brought rare spices back from their travels, whilst the croissant, originally eaten in the Far East, came to Britain via Vienna and then France. The discovery of the New World brought potatoes and tomatoes to our diet. Food has always been used as a tool of differentiation between the classes. In medieval times, noblemen sat at the high table eating venison whilst the lower ranks at the far end of the hall were given ‘umble pie’ – the guts or ‘umbles’, wrapped in a rough flour and water crust and cooked in the embers of the fire. The belief that the purer the food the better saw those same noblemen eating refined, white bread whilst the poor ate gritty but fibre-rich rye. Sugar in Elizabethan times was worth more than gold and kept locked away in a safe, with the blackened teeth that resulted from eating it seen as a status symbol. The scourge of slavery was as much fuelled by the highly profitable demand for sugar as it was for cotton. Later, the Melton Mowbray pie came into being as a means of feeding the rich hunting classes, with its hot-water-crust pastry robust enough to withstand being carried cross-country on horseback. It stands as a classic example of a good food unique to its use and its area of production. The development of the coaching trade and improvement in transport systems spread the fame of regional foods and supported their distribution around the country. As demand for particular foods outstripped supply, farmers and food producers worked co-operatively to fulfill demand. Many of these organisations became models of the democratic principles of fairness and equality for all. The exodus of people from country to towns in the industrial revolution changed food production forever and weakened links with regional food. Local recipes were changed to make them easier to mass produce and farming techniques were devised to grow crops on a larger scale. Food shortages during emergencies such as the two world wars resulted in the introduction of national styles of basic food stuffs such as bread and cheese. Food production in Britain hit an all-time low in the 1890s, with food adulteration scandals, poor trading standards and the pollution of farm produce a common occurrence. Matthew brought his talk to a close by touching on the resurgence of interest in good quality food in UK and the renaissance in demand for regionally produced food. 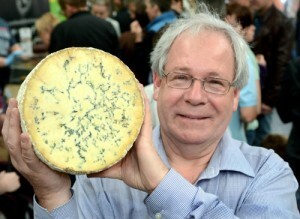 He then kindly shared samples of locally produced food – as Stilton cheese and Melton pies with the audience. Read about Matthew’s recent role as Chairman of the British Pie Awards and discover more about the origins of Stilton cheese.